"We see Titan as a natural oasis of remarkable astrobiological significance to understand the environment in which origin of life took place on Earth," said Josep M. Trigo-Rodriguez, with the Institute of Space Sciences (CSIC-IEEC) in Barcelona, Spain.. "It seems that a plausible scenario to build life consists of a dense atmosphere, where small particles like organic haze and meteoric metals could act as catalysts for the formation of more complex organic compounds from simple precursors such as carbon monoxide and methane, thus promoting increasing complexity." "Titan provides an extraordinary environment to better understand some of the chemical processes that led to the appearance of life on Earth,” added Trigo-Rodriguez. “Titan’s atmosphere is a natural laboratory that, in many aspects, seems to have a strong similitude with our current picture of the pre-biotic atmosphere of Earth. This is remarkable, because it was thought that Earth and Titan were made from a vastly different recipe of materials in drastically different temperatures," he says. 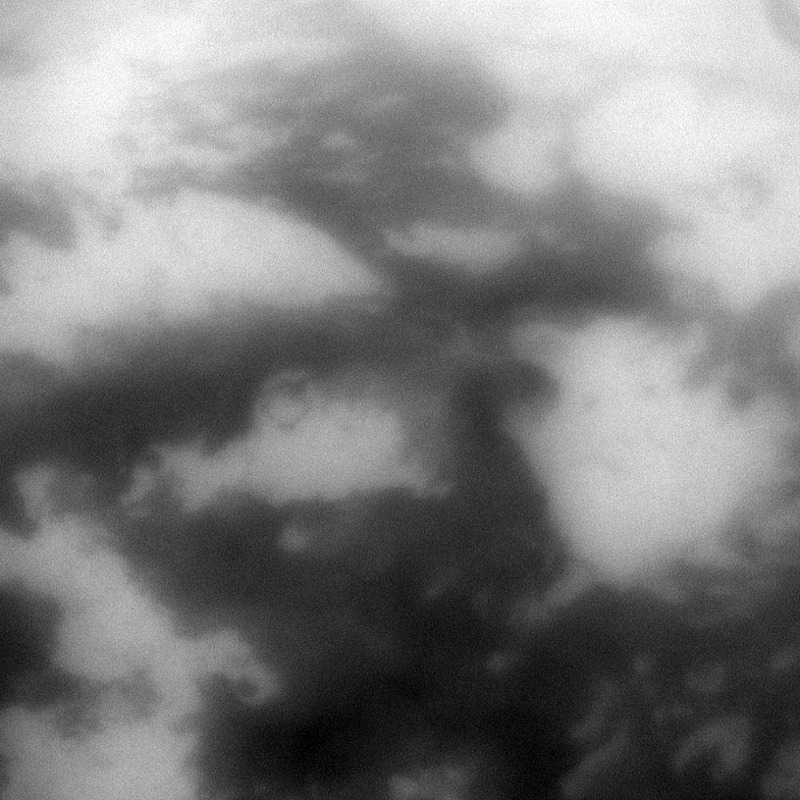 The image below shows a portion of Titan's low latitudes taken by the Cassini probe on October 12, 2009. The view was obtained at a distance of about 296,000 kilometers (184,000 miles). The bright patches are more reflective than the dark areas and are probably made of icy materials such as water ice or frozen carbon dioxide. The dark areas likely host dune fields which are common in the low latitudes of the moon where prevailing winds seem relatively strong. A dark circular ring in the upper boundaries of a bright feature toward the center of the portion is likely the outcome of a meteoritic impact. This circular patch may also be a caldera or a cryovolcanic feature. The 2013 research paper, "Clues on the importance of comets in the origin and evolution of the atmospheres of Titan," by Trigo-Rodriguez and F. Javier Martin-Torres (Center for Astrobiology, Madrid, Spain), the source of this post, offers insight into the atmospheric affinities of Earth and Titan. Trigo-Rodriguez and Martin Torres studied how hydrogen, carbon, nitrogen and oxygen isotopes reacted with their environments on Earth and Titan. They looked at data recorded by the Cassini-Huygens probeto better understand the isotopic ratios in Titan's dense, hazy atmosphere. 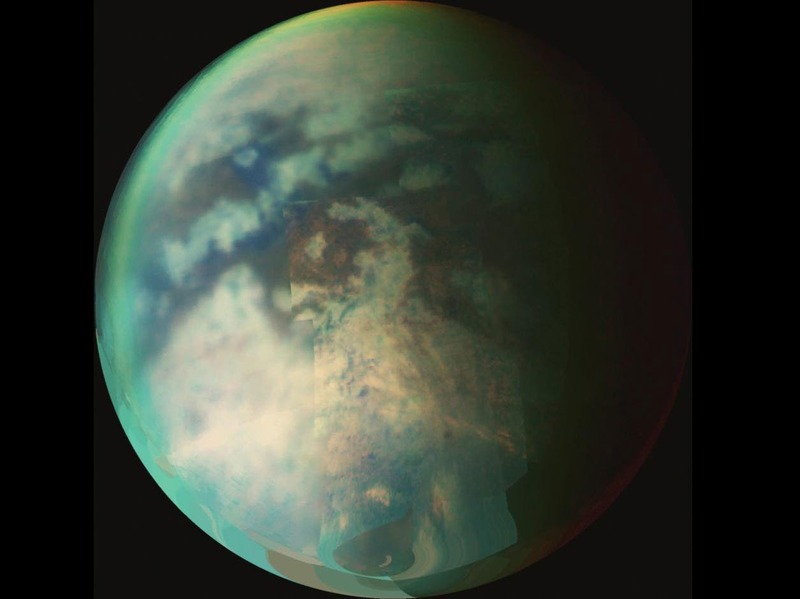 Scientists are wondering how Titan is able to maintain all of its atmospheric methane. According to McKay, "Earth's atmosphere is composed of compounds that persist over billions of years. However on Titan, all of the methane should have been destroyed by sunlight on a timescale of about 30 million years. There must be a source of methane re-supply." As Paul Davies, a leading authority in astrobiology, director of BEYOND: Center for Fundamental Concepts in Science and co-director of the ASU Cosmology Initiative, said: "To the best of our knowledge, the original chemicals chosen by known life on Earth do not constitute a unique set; other choices could have been made, and maybe were made if life started elsewhere many times." 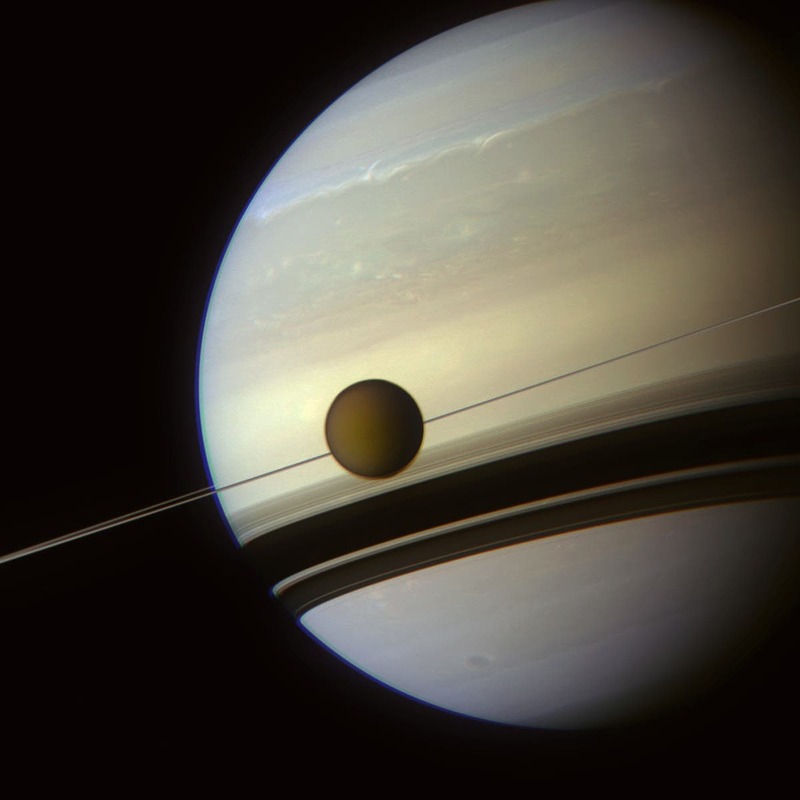 NASA's Cassini spacecraft, which has detected large molecules at altitudes of some 600 miles above Titan's surface. But the molecules are so far unidentified because of limitations to the craft's instruments. In 2013, the Cassini research team replicated Titan's atmosphere in a large chamber at the temperatures present in the moon's upper atmosphere. To play the role of the sun's ultraviolet light hitting Titan's atmosphere, they used radio energy at a power level comparable to a modestly bright light bulb. The UV light is critical because it breaks up molecules such as molecular nitrogen or carbon monoxide in Titan's atmosphere, leaving the individual atoms to choose up different partners, forming new molecules. Researchers havew showed how water molecules ejected as part of Enceladus's geysers can be carried great distances through the Saturn system, with some oxygen-bearing molecules finding their way to Titan. Early Earth: "Life Could Have Reseeded the Surface Multiple Times During Bombardment by Comets and Asteroids"